Learn the Modified Somsak nerve transfer (medial head of triceps nerve transfer to anterior division of the axillary nerve through a posterior approach) surgical technique with step by step instructions on OrthOracle. Our e-learning platform contains high resolution images and a certified CME of the Modified Somsak nerve transfer (medial head of triceps nerve transfer to anterior division of the axillary nerve through a posterior approach) surgical procedure. The triceps to axillary nerve transfer was popularised by Somsak Leechavengvongs for the management of deltoid paralysis in the C5 avulsion brachial plexus injury. Modifications have been described using the medial triceps branch and transfer to the whole axillary nerve to re-innervate the anterior and posterior deltoid as well as the theres minor. I prefer the medial triceps branch because it avoids denervation of the bi-articular long head of triceps which is important to maintain posterior shoulder stability in an otherwise paralysed shoulder. In addition the medial triceps has a greater motor axon density. 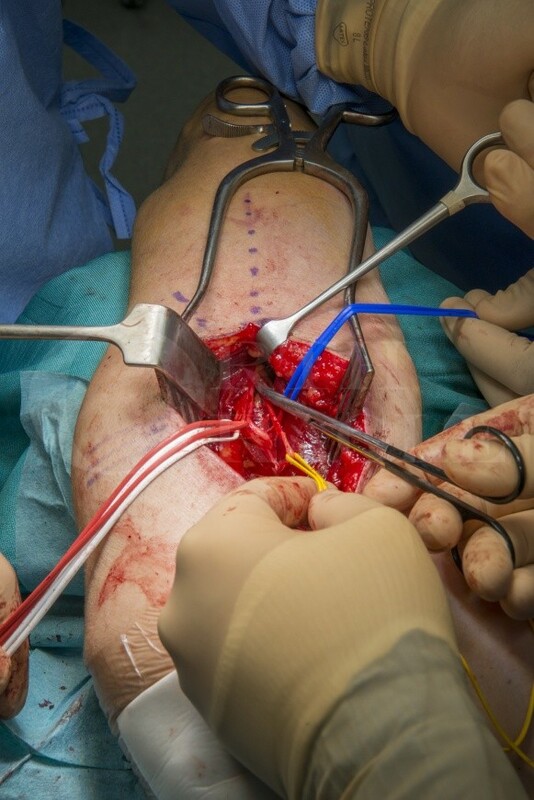 I perform co-aptation to the anterior division in a pure axillary nerve lesion or to the anterior and posterior divisions after removal of the fascicle to the upper lateral cutaneous nerve of the arm from the posterior division in a C5 lesion. The latter technique provides restoration of external rotation through re-innervation of the theres minor. Restoration of external rotation in a C5 lesion is often weak when the traditional Somsak transfer to the anterior division is combined with spinal accessory transfer to the supra scapular nerve. The rationale for this technique will be discussed further in the spinal accessory to supra scapular nerve section.